There are so many things that separate Canadians from other countries such as their love to share magic moments, especially on social media. Tapping into that cultural power, TD was looking for ways to leverage “throwback Thursday” (#tbt) or “flashback Friday” (#fbf) in their next campaign. 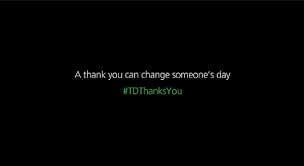 Today, TD is reflecting on then and now, and saying thank you to its customers for allowing it to play a role in many of their significant life milestones in their second #TDThanksYou campaign. One of the ways TD is saying thank you to customers for allowing it to be a part of their lives over the years is by surprising some of its customers with the ultimate throwback experience and sharing their then and now stories through a compilation video that can be viewed and shared here. TD is also celebrating its customers with a fun throwback theme in branches and by sharing special thank you messages in person and on the phone, through online and mobile channels and its ATM network, and in advertising and social media across TD’s North American footprint..
TD is also sharing its stories via Twitter and Facebook, as well as encouraging everyone to share the stories and their own memories using the hashtag #TDThanksYou.